The days of Mainline Track being only mini focused are now numbered! We’re expanding our range of products to suit excavators 1 – 40 + Tons! Here’s the article, as seen in Deals on Wheels’ first edition of 2019. 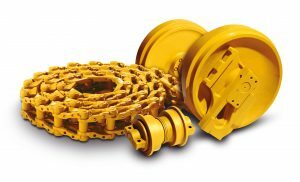 “Mainline Track’s Tuff range of rubber tracks and undercarriage for mini diggers has just been given a boost. VMT is a European undercarriage brand with global reach and Mainline Track was recently awarded the distribution rights in New Zealand. The company says this is a key step forward for the business, ensuring they can now support their customers with a consistent product range 1.5 tonnes up to 30 tonnes, supplied from stock across New Zealand. The key to this product is not only its alignment in terms of quality with Mainline Track’s TUFF brand but also consistency: whether they’re supplying a single sprocket, idler or roller, or a complete track group undercarriage solution, the company says it will arrive at the same time and the same brand. Truan Bailey, Mainline Track’s managing director, explains that they have had substantial consistent growth for the past eight years, and he puts this down to one key thing—having a clear view of what they are good at and sticking to it. Coupled with an extremely customer orientated culture, Truan says this core is what they’re now building on to create a unique offering in the New Zealand market. “It’s what we call a 360-degree wearing parts solution for excavator operators,” Truan says. Having sold rubber products for more than eight years and mini undercarriages for five, Truan says the business is ready for this next step and the infrastructure is in place to deliver a substantially increased product range with the same service levels, with stock centres in Auckland, Christchurch, and centrally situated Nelson. “We’re well positioned to serve virtually all of New Zealand on a next-day delivery basis,” he says. While Truan doesn’t let on too much, it appears that Mainline Track has got a system of specification records for all excavators in New Zealand. This feeds into their stock codes, which enables them to quote fast and accurately.